The most common weapon of the Middle Ages was the spear. It was cheap and easy to make since it required very little metal, kept the enemy at a nice distance, and was simple to use. A spear could deliver a lethal thrust, and was quite deadly in the hands of an experienced fighter. The spear is such an effective weapon, in fact, that Midgard does not use them in normal fighting--someone could get hurt! They are reserved for special fighting routines and living history. Atli's tutorial on forging a spearhead is on the Anvilfire site, http://www.anvilfire.com/iForge/ , demo number 152. New rec fighters are restricted to using non-metalic weapons, as stated in the fighting rules. Usually this means a club. Oddly enough, the only people shown using clubs on the Bayeux Tapestry are Duke William and Bishop Odo--clearly the simply bludgeon already had some of the status it was to enjoy as it evolved into the mace and the sceptre. For our purposes the club is a sturdy hardwood stick, preferably with a loop of cord or thong to go around the wrist. It may NOT be pine or softwood. Test it by striking it very hard on a concrete or stone surface. The sword was the ultimate weapon, and steeped in symbolism. It was double-edged, straight, and slightly tapered, the blade being about 28 to 30 inches long by 2 inches wide at the hilt. You must be steel qualified to use a steel sword. Not only should it be at least reasonably accurate in appearance, but it must be a weapon that you can handle safely. The edge must be blunted to the thickness of a US penny, and the point cannot be sharp. Shop around before buying a sword, to make sure that you get one which is good looking as well as strong enough for fighting. People are beginning to experiment with wooden swords, for training as well as fighting. Wooden training swords are also called "wasters". If you want to try one in a public battle reenactment, it must be painted to look like a real sword. 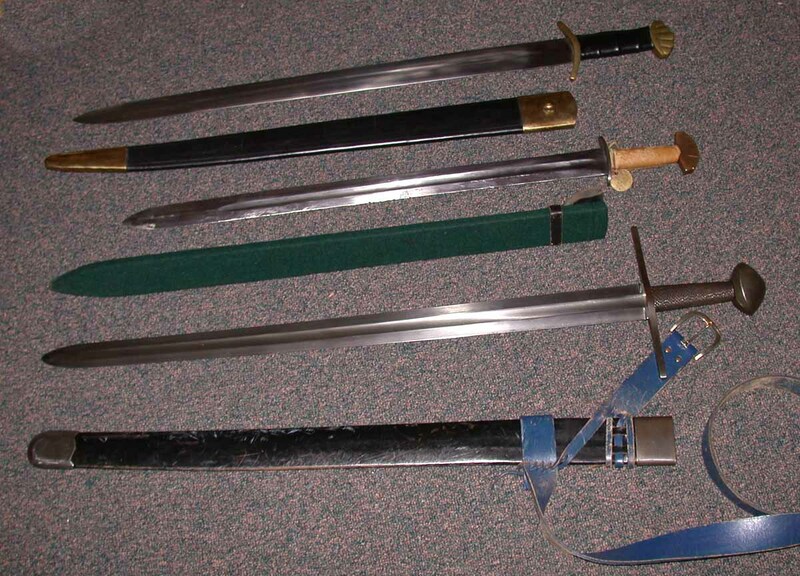 Three of Matthew Amt's swords, 154 K. At top, a very cheap repro Viking sword with leather scabbard. It has a very thin tang and so will probably break unless you swing it VERY gently! The pommel and guard are not bad, and the appearance of the blade could be worse. The scabbard is not correct but is not too offensive. 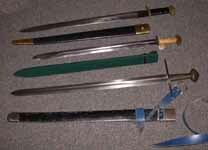 Center, my fighting sword, a cut-down and re-hilted Windlass Steelcrafts Katzbalger. I made the pommel from a half-inch thick chunk of brass, and the guard is quarter-inch thick steel. My steel qualification disc is tied to the grip. The scabbard is wood covered with wool, and is tipped on edge to show the completely hypothetical leather belt loop. Bottom, my 13th century Del Tin sword, with a brazil-nut pommel. Again, the all-leather scabbard is not correct but won't break if you fall on it. I added the belt, copied from the funerary brass of Sir John D'aubernon. A scramasax-type knife may be worn on the hip, and "fighting saxes" may be used. Double-edged knives or daggers may not be carried, and no blade may be worn on the leg or arm since that is not authentic. Knives do get lost during battles, and you can be injured if you fall on it. The axe was another cheap weapon, though Viking battle axes in particular could be richly decorated. While any farmer's felling axe could be used for war, axes designed for battle had thinner blades and were not as efficient at splitting logs. Steel axes may be used only by steel-qualified fighters, subject to the fighting rules. Edges should be blunted to the thickness of two US pennies. Axes with cast aluminum heads may also be used; they are somewhat lighter than equivalent steel axes and therefore safer, but are not as good for display purposes. Axes may even be made with heads cut from half-inch plywood, fixed in a notch in a hardwood handle and painted black. These may be used by non-steel-qualified fighters. Other materials for axe heads, such as leather or rubber, may certainly be attempted, but check with the Earl, Battlemaster, or a Steel Qualifier before using them. 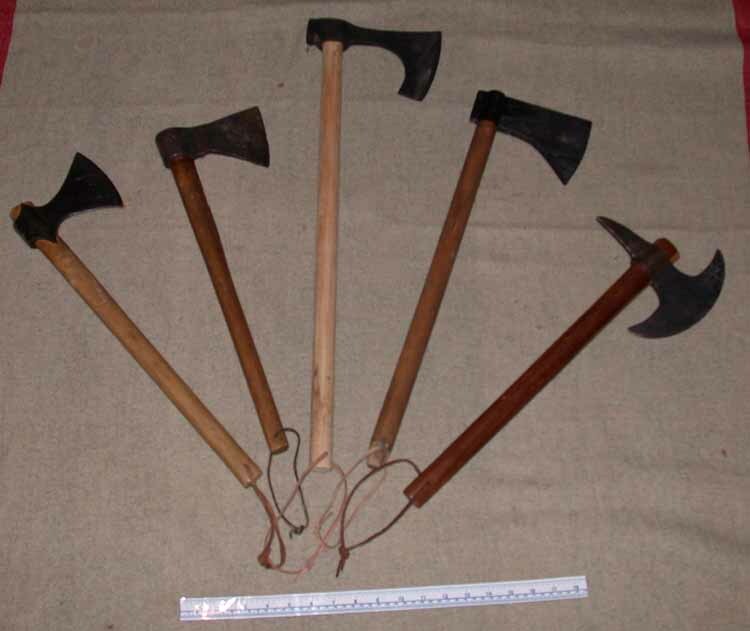 Five of my axes, 30 K. From left to right: Viking axe with cast steel head. 18th century tomahawk with hand-forged head, almost indistinguishable from some medieval types. Viking "skeggox" from Albion Armorers. The next one is has a head cut from half-inch plywood! It is glued and nailed into a notch in the end of the handle and painted black. Last is a hand-forged reproduction 18th century naval boarding axe masquerading as a 13th or 14th century battle axe. All have wrist thongs! Bows and arrows used in a reenactment battle must meet all safety requirements as usual. Bows that are not wood should look like wood--green, blue, or red fiberglass ones can be painted beige or light brown. Archers may wear a bracer on the left wrist, and a shooting glove or tab. For rules on arrow construction, see http://www.markland.org/rulesfrat.php#arrows.